The last time I went to the cinema with Rich, it was to see Cabin in the Woods – and we weren’t the only Bleeding Cool people there either. A few weeks later, we sponsored free tickets for a screening of the film so that lots of our readers could see it ahead of release too. This was one movie we got rather passionate about. And many of you, it seems, shared our enthusiasm. 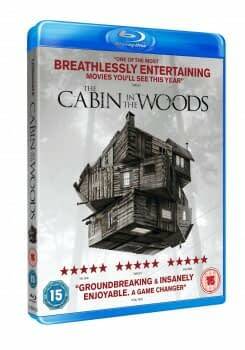 Now that the film has been released on DVD and Blu-ray here in the UK (and indeed, over in the US) we’ve got three copies of the British Blu-ray edition to give away. We’ve also got one poster for the film, signed by co-writer and director Drew Goddard. If I had that to keep I’d get a cellar put in just so I had the perfect place to keep it, mixed in with lots of scary bric-a-brac. If you want to win a Blu-ray or, if you’re really lucky, a Blu-ray and the poster, you simply have to follow Bleeding Cool on Twitter then re-tweet our special competition tweet. We’ll choose winners on Thursday and contact them by DM to get their addresses. The normal Bleeding Cool terms and conditions apply.